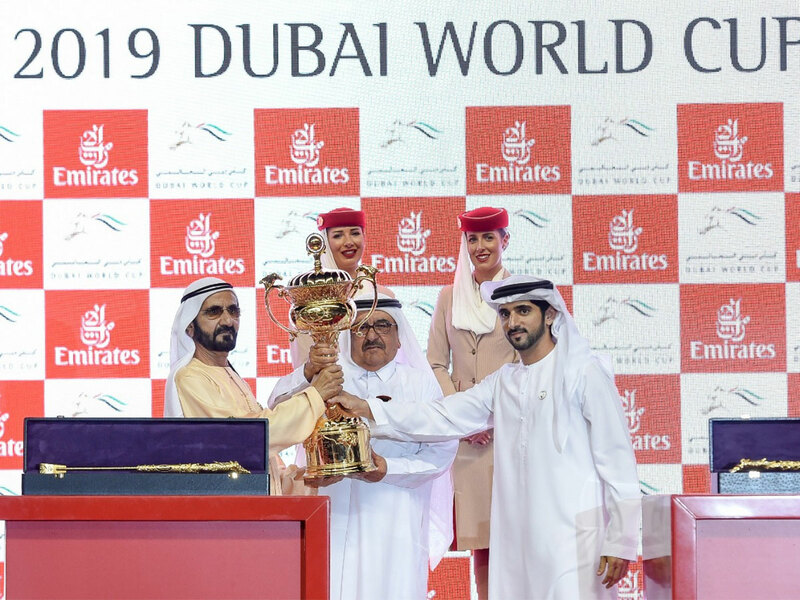 A staggering $35 million in prize money is at stake as curtains rise for Dubai World Cup 2019. The day’s action features nine races over distances varying from 1,200 metres for sprinters to 3,200 metres for the long distance specialists. The action takes place on the dirt and turf tracks at Dubai’s iconic racecourse, Meydan. 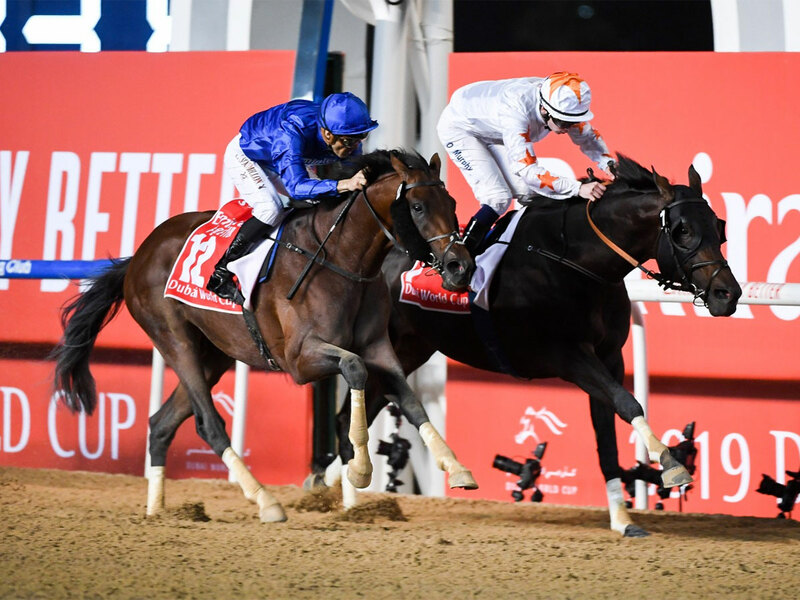 Watch: Thunder Snow wins the Dubai World Cup 2019. Thunder Snow, ridden by C Soumillon, trained by S Bin Surour and owned by Godolphin wins $12m Dubai World Cup, sponsored by Emirates, in a thrilling finish. Dubai did it! Thunder Snow wins the final race of the Dubai World Cup! 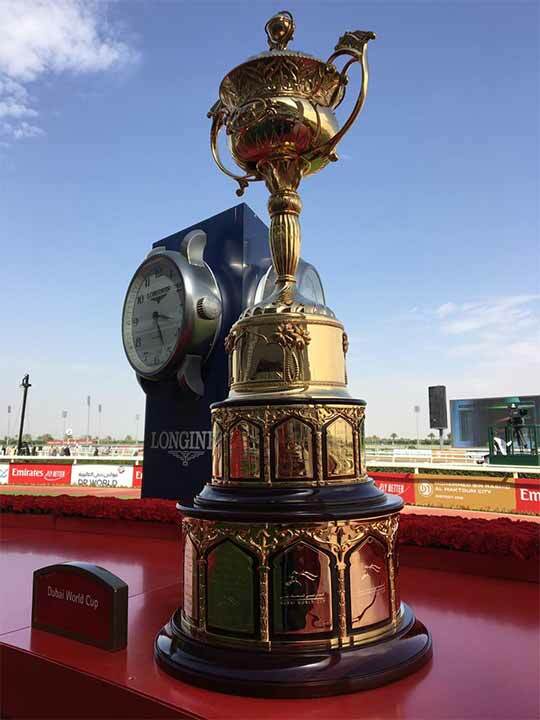 Dubai World Cup, time for the Grand Finale! Here is a preview ahead of the final race of the night. 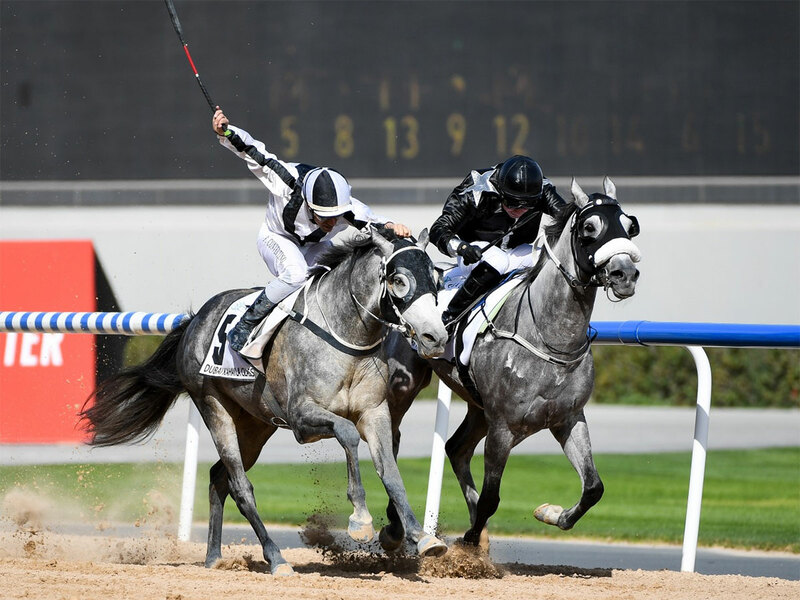 Dubai World Cup 2019, Race 8 ends with Old Persian winning the top spot. Old Persian, ridden by W Buick, trained by C Appleby and owned by Godolphin wins $6m Longines Dubai Sheema Classic, sponsored by Longines. Next race: Dubai Sheema Classic. The contenders arrive. Dubai Turf, the seventh race of the #DubaiWorldCup winners awarded. Race 7 is over, find out who won. Dubai WorldCup 2019, just two more races to go! Almond Eye returns triumphant. Jackie Doyle tells us why she's the horse to look out for in the future. My name is Eleanor and I am from New Zealand. I am 23 years old. It’s my first time here in Dubai! My dress is Nicola Fenetti, an Australian designer. My name is Emma Wells from Australia. I can’t believe I won runner up! It’s amazing. I’ve been in Dubai all week. I love it and I’m so lucky to be here. So I originally found the dress and I fell in love with the colour and sequins. I felt like the dress was very bright, so I wanted a simple hat. I found this pilot hat that I designed myself. I am insurance broker. But one of my hobbies is visiting to Fashions on the Field in Australia, so I love fashion but it’s the first time so something fashion related internationally. Race 7 of the Dubai World Cup is about to begin. Here's a preview. Next race: The Dubai Turf for $6 million. Find out who will win. 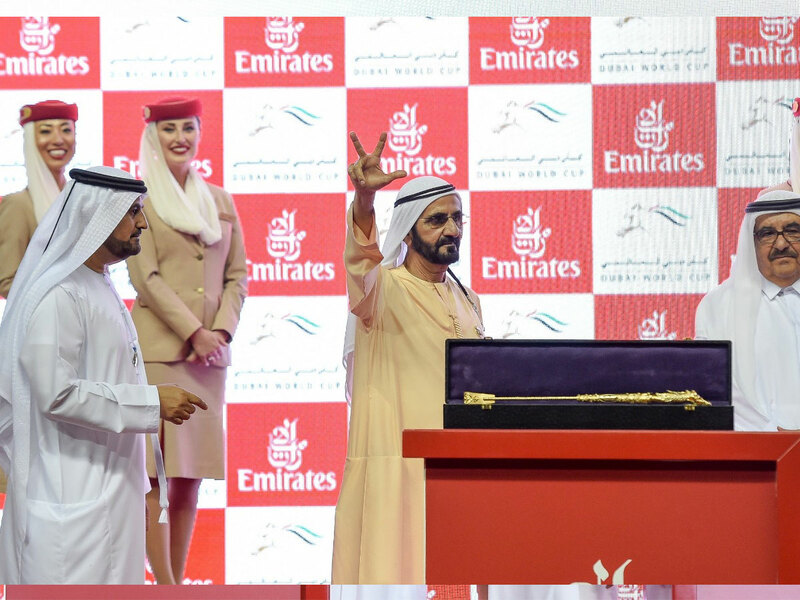 Gulf News’ Editor-in-Chief , Abdul Hamid Ahmad, presents the awards for the Golden Shaheen Race at the Dubai World Cup. Winner of Race 6, XY Jet. Post-race analysis after Race 6 - Golden Shaheen sponsored by Gulf News. XY Jet, owned by Rockingham Ranch, ridden by E Jaramillo and trained by Jorge Navarro, wins $2.5m Dubai Golden Shaheen, sponsored by Gulf News. Golden Shaheen, Race 6 of the Dubai World Cup, sponsored by Gulf News kicks off. Coming next: Golden Shaheen, Race 6 of the Dubai World Cup, sponsored by Gulf News. Pre-race analysis for Race 6 - the Golden Shaheen sponsored by Gulf News. Winners of best dressed couple were Nader Tearab from Sudan and his wife Yao Zhengqi from China. Nader is a designer by profession. “I can’t believe I won it for the fourth time! This outfit wasn’t easy to come up with. We have been working together for 3 months. This is the first time I’ve ever designed a dress! I am usually a suit designer. Because it’s spring in Dubai now, we had to choose a colourful dress. We chose purple French lace. I made her outfit first and then I made my suit to match her outfit. Light wool is the best fabric for spring. We are so happy to have won!” said Nader. Post race analysis for Race 5 - the UAE Derby. Best dressed man was won by Miles Hamby, aged 71 years old. “This is my first time at the World Cup and its my first time in Dubai, my first time in the Arabian peninsula! I did not expect this at all! I am from Alexandria, Virginia from the state of Washington DC. And I am a very good friend of Leon the Runner Up. We both stayed at the same hotel and we rode camels together yesterday. I am a retired statistics professor. My family is from Kentucky and my family goes back to about 200 years ago in Kentucky. My father was a Kentucky colonel, his father was a Kentucky colonel. This outfit is classic 1889 Kentucky which was the first year of the Kentucky derby. Every year I host a 1889 themed Kentucky Derby party, where everyone comes dressed up. After this I am going home to celebrate!" Pre-race analysis for Race 5 at the #DubaiWorldCup - the UAE derby. Runner up for best dressed man was won by Leon Harris aged 72. "I am based in DC. I came here for the races. I have been here 36 times. I participated so many times in style stakes. But this is my first win as runner up. It’s my first win for anything actually! I can’t believe I won! I invited my friend to come with me. I teach Argentine tango teacher and he is my student and he ended up winning best dressed man! As you can see I am an older guy. So my outfit is kind of conservative. These colours are my favorite colours. Beige, white. They just fit me. I honestly dress like this all the time, not just for this event," he said. Shaikh Mohammad watches as Race 4 of the #DubaiWorldCup kicks off. Corina Tutoiu from Australia won best hat prize. “I was so nervous. And I was a bit late to the stage because I went to the bathroom. I almost missed my chance to be on stage! I am from Melbourne. My hat is inspired by Lady Gaga. The dress was made by me. The hat is made by a friend who is a milliner and a nurse. I work as an emergency room nurse in Australia. I am speechless and so happy that I won! I am here on holiday and because I love fashion! My grandmother made it with love. Everything. She made the cakes and macaroons. She’s 80 years old. I feel super happy and I feel like I have to take her to an afternoon tea. She just magically did it! It took many days for her to make this hat. About a month before the event, she started working on it. I live in Bangkok Thailand, but I love wearing fancy hats, so I had to take this opportunity to be a part of this event. I chose this hat because it’s fun and quirky. Pre-race analysis for Race 4 at the #DubaiWorldCup - the Al Quoz Sprint. Cross Counter wins $1.5m Dubai Gold Cup, sponsored by Al Tayer Motors. Race 3 of the #DubaiWorldCup kicks off. Who will be the winner? Dubai World Cup: Race 2 just ended, here is the post race analysis. 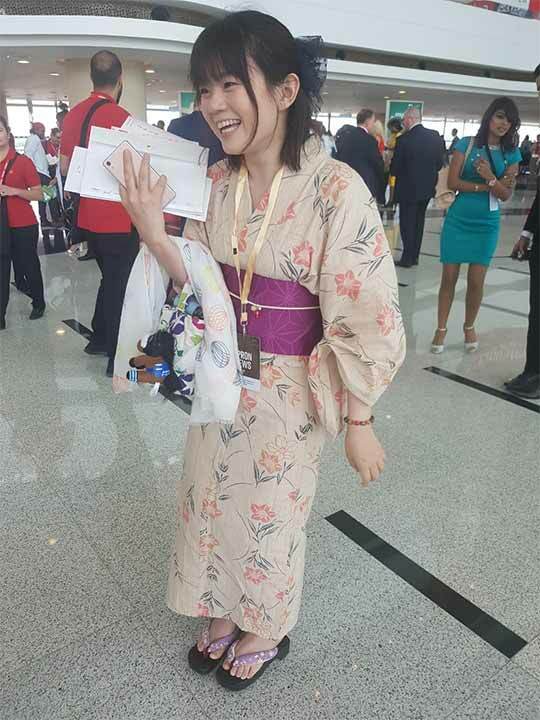 27 year old Satomi from Japan is on a three-week holiday and came to Dubai just for the World Cup. Full of smiles, Satomi said she loves Japanese horses and wanted to support the Japanese entries in the races. 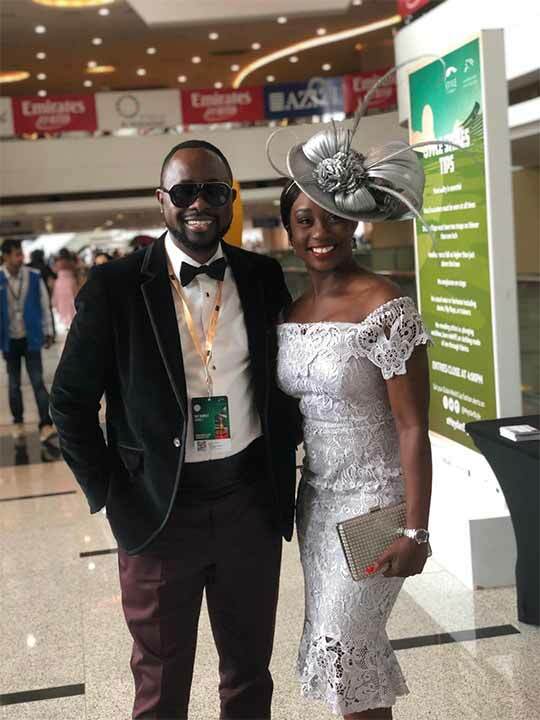 Husband and wife Yemi Adelaja and Cecilia Goodwin are here from the UK for their first Dubai World Cup as a couple. Stands slowly filling up as Style Stakes registrations are on in full swing. The moment you’ve all been waiting for is finally here – it’s the 24th running of the Group 1 Dubai World Cup, currently the richest race on the planet with a staggering prize purse of $12 million (Dh 44 million). The day’s action features nine races over distances varying from 1200 metres for sprinters to 3200 metres for the long distance specialists. The action takes place on the dirt and turf tracks at Dubai’s iconic racecourse, Meydan. 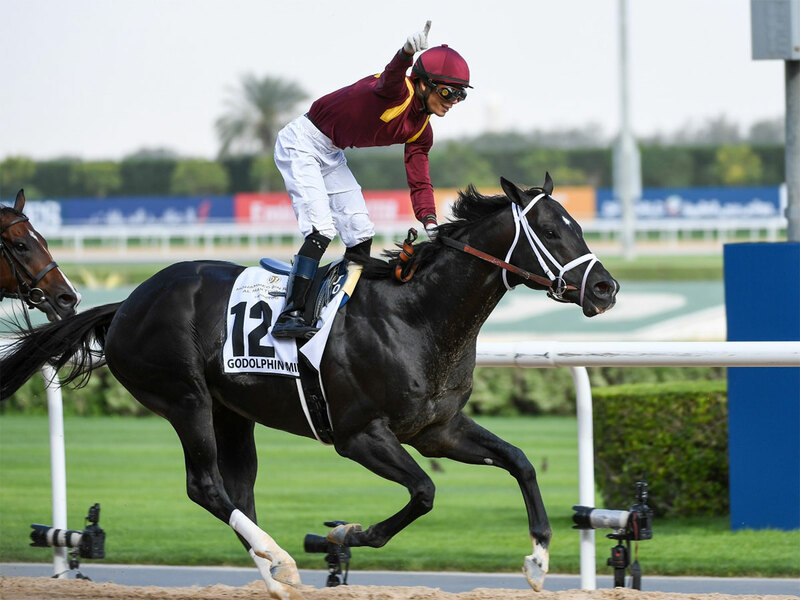 The action blasts-off at 15:45 on the dirt with the $1million Dubai Kahayla Classic, a showpiece race for Purebred Arabian horses and culminates in the Dubai World Cup at 20:45. In total the prize money on offer for the nine races is a record $35 million. The days is the undisputed sporting and social highlight of year and has much more to offer than its card of nine races. From the fantastic hats and dresses that the ladies wear to the elegant suits worn by their male counterparts, Dubai World Cup day is both glamorous and unique. More than one billion TV viewers across 150 territories around the world had access to last year’s extravaganza, broadcast live from Meydan by a crack team of experts and presenters. With horses from over 15 countries competing in the nine world-class races, the broadcast was also available live on nine cruise lines and 11 airlines, including title-race sponsor Emirates. The entertainment continues even after the last race and well into the night with an electrifying concert by multiple Grammy Winner Gwen Stefani. To sum it all up the Dubai World Cup has something for everyone however your choose to celebrate it.